An unsigned history found in the synagogue indicates that the first Jews arrived in North Adams in 1867. These first immigrants, busy with the important functions of day-to-day living, had little time to contemplate any historical significance of their actions. They left no records of their religious activities that we've been able to find. But we've discovered newspaper accounts of their High Holiday services in 1888.
to purchase a plot of land on Francis Street from Emily P.Witt for $500. 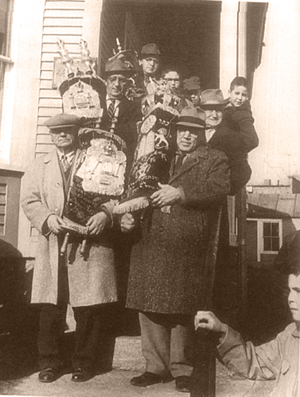 They took the name House of Israel and constructed North Adams' first synagogue there. Early maps illustrate access to the synagogue by way of a passage from State Street labeled Synagogue Road. At the same time, they engaged the Reverend Simon Ratner as Cantor-Shochet. 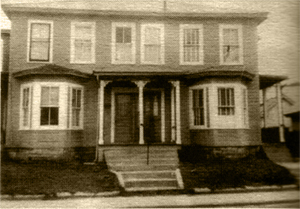 In 1895, this group established a Chevra Kadisha which has continued its work throughout the history of the community. Green, H. S. Katsch, Barnard Cotton, B.
as the United House of Israel under the presidency of Jacob Cohen and the directorship of Hymon H. Kronick, Morris Kronick, Samuel Richton, Max Feder, Louis Salkin, William Less, David Bashevkin, Barnet Ark and Jacob Lenhoff. One year later (December 27, 1923), the United House of Israel was able to burn its mortgage. One year after that (January 16, 1925),under the presidency of Barnet Ark, the United House of Israel engaged its first rabbi, Rabbi Irving Miller. Rabbi Miller remained with theCongregationor only one year; he was not replaced until 1936.
in July of 1958, Bernard Lenhoff, acting as counsel for Chai Adom, proposed a merger of the two congregations.This proposal was accepted at a special meeting of the United House of Israel. At the same time, President Harry Wein informed the membership that the Urban Renewal Authority had announced that the Congregation would be able to conduct its High Holiday services in the Center Street building, but that it would be necessary for them to be prepared to remove all personal belongings at the end of that period so that the building could be razed. By November of 1958, Joseph Shapiro, president of Chai Adom, was appointed to the Board of Directors of the United House of Israel. 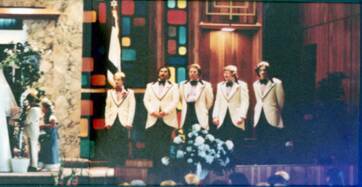 At this same time the merged organization, which adopted the name of the larger group, United House of Israel,began its regular meetings and services in its new /old home in the synagogue of Chai Adom on Ashland Street. 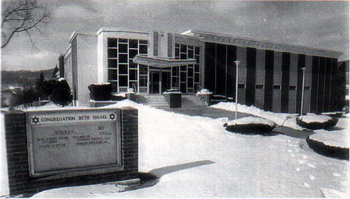 Because space was limited in the little shul, and because the holidays fell on the weekend in 1959, the United House of Israel was able to use the Drury High School Auditorium to conduct High Holiday Services. In 1960 and 1961, the Masonic Temple was secured for this purpose. From the Ashland Street synagogue, the combined group continued its search for an appropriate new home. Discussions with the City of North Adams over the suitability of offered urban renewal site locations took a lot of time. Discussions with members over other proposed sites and with architects also took much time. It was the end of May 1960 when the keys to "the Herbert B. Clark property at 265 Church Street were transferred to the Directors of the United House of Israel, signaling the conclusion of a long, arduous search. The Clark mansion was to be torn down and the new synagogue built on the site. The same directors' meeting that heard the final step in the search for a new home learned of the necessity of still another new search. 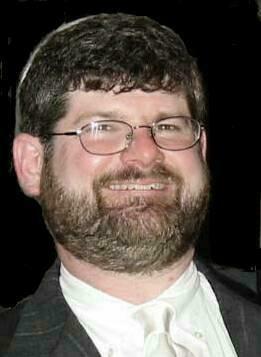 Rabbi Abraham Halbfinger had accepted a new position in Quebec, Canada. In October of 1960, Burton Shapiro proposed that the Congregation conduct a poll of its members to determine the feasibility of hiring a Conservative rabbi. The proposal was adopted by the board, but the results were not implemented until 1969. Additional problems arose during the following March when the general contractor for the construction of the new building announced insolvency, forcing the community to spend time investigating alternative builders. 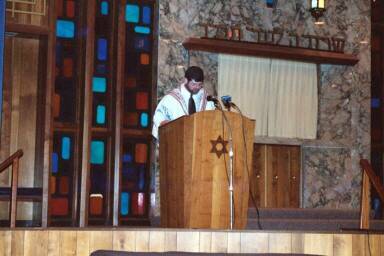 By April 1961, the directors selected a new contractor to complete the building and by June they selected Rabbi Earl Fishhaut, an Orthodox rabbi, to lead the Congregation. at the general meeting on October 25, 1961.
building would be ready for occupancy by December 1961 and the Board of Directors announced that the Dedication of the new synagogue would be held on April 8, 1962. 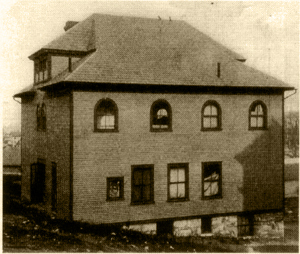 By 1927,the organizations meeting in the Hebrew Community Building had expanded to include a Jewish Boy Scout Troop, organized by Harry Melcher, Scout Master, with Macy Kronick as Senior Patrol Leader; a Young Judea group under the auspices of Hadassah; and a Chapter of the Jewish War Veterans. On September 3,1931, fire destroyed much of the Hebrew Community Building. Through the generosity of Grover Bowman, Superintendent of Schools, the city of North Adams offered the Drury High School Auditorium to the United House of Israel for its High Holiday Services. In 1935 the Daughters of Israel Aid Society changed its name to the Ladies Auxiliary to the United House of Israel. Throughout its history, in the words of the Fiftieth Anniversary Book, "the organization has worked diligently in every endeavor both spiritually and materially for the welfare of the Community in general and the Synagogue in particular." This fresco was found in the attic of the building, now an apartment house, while investigating the history of the congregation. The fresco, as seen here, is in excellent condition because the attic is dark and unused. 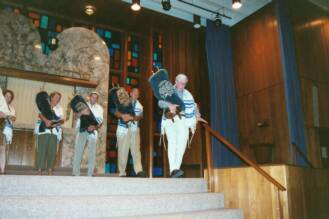 Removing Torahs from the arc on Church Street for the last time during the deconsecration ceremony. Rabbi Jeffrey Wolfson Goldwasser at deconsecration ceremony. This history is composed in part of portions of The First Hundred Years compiled and written by Carolyn Kaplan. 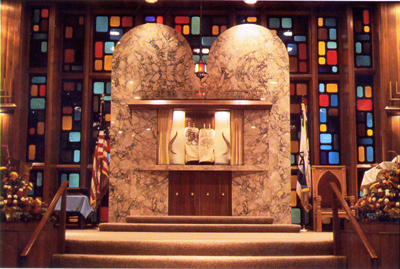 It was published in the Congregation Beth Israel Centennial Book published in October, 1995. Other contributors include Elma Sanders and the office of Michael Rosenfeld. * All the books of the organization must be in a clear Jewish language. * Dues were $8 per year. * "When one brother starts to talk without the permission of the president, he is fined 25 cents." * When a member gets permission to talk at a meeting, he must stand up. * When a member uses "improper words" against another member he is fined 50 cents. ability to get it for him through the brothers. to visit sick one as often as possible. When the sickness is contagious, the visit must stop. to always agree with the decision of the majority." 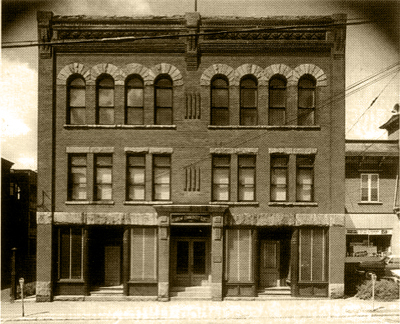 Be sure to view the next page about our Lois Street Building.